Many a social and political processes related to projection of some icons and undermining of the others have intensified during last few years. Even during the last regime of NDA led BJP rule from 1998, Savakar’s portrait was unveiled in the Parliament. At one level the game of undermining some icons and projecting icons is a part of various political streams and RSS seems to be the past master in the same. One recalls its machinery has been putting forward some names. bypassing others and undermining some others. Since the time Modi has come to power as Prime Minister Mahatma Gandhi’s assassin Nathuram Godse is being upheld by many from RSS combine. One BJP MP called him a patriot and other BJP MP said that Godse chose the wrong target, instead of Gandhi; he should have chosen Nehru as his target. There are demands from various quarters to allot land for raising his statues in different places. Times and over again Sardar Patel is projected vis a vis Nehru. In one of the speeches Modi said Patel should have been the first Prime minister of India instead of Nehru. Various ‘word of mouth’ propaganda to denigrate Nehru has been the consistent activity of many. Again to undermine Nehru Modi said something which was not true. He said that Nehru did not attend the funeral of Sardar Patel. This again is a blatant lie. As far as Mahatma Gandhi is concerned this present ruling dispensation has projected him but only for the values of cleanliness. One knows that the stature of Mahatma is such that even those who do not believe in his inclusive nationalism have also to pay obeisance to him at home as well as abroad. To circumvent this problem while the core essence of Gandhi’s struggle for Hindu Muslim unity is sidelined, the teachings of the Mahatma for National Integration are give a go bye and he is projected for only for swachhta abhiyan (cleanliness drive). Currently major concerted efforts are being made to highlight Ambedkar. There are statements that Ambedkar and Hedgewars’ (The founder and first supreme leader of RSS) values were similar, both were against untouchability for example. RSS mouthpiece Organiser (English) and Panchjanya (Hindi) have come out with the special supplements on the life of Ambedkar, presenting his teachings in a distorted manner to create the illusion that there was similarity between the teachings of RSS ideology of HIndutva and Ambedkars values. Ambedkar had contributed in various ways for social justice and democratic values and struggle for annihilation of caste was the foremost amongst the movements launched by him. Incidentally one need to recall that in contrast to Ambedkars Annihilation of caste, RSS has floated and organization called ‘Samajik Samrasta Manch’ (Social Harmony Forum) which works for bringing harmony between castes without challenging the very existence of caste, which was the prime motive of Ambedkar. One can see two trends in the exercise being done by the RSS combine. On one hand since RSS never participated in the freedom struggle as an organization, it has no icon to present as a freedom fighter. This is why they have to stretch their myth making to project Savarkar as being a freedom fighter. The case of Savarkar is peculiar. He was initially working against the British rule but after he was jailed in Andaman’s, he buckled under pressure and turned from anti British revolutionary to the one who apologized to British and later never participated in any anti British agitation. That’s all RSS combine has to show for their participation in freedom struggle. Even Savarkar was not the part of RSS, but ideologically Savarkar and RSS both held Hindutva, Hindu nation as their goals. As many in the RSS combine revere Godse, he always slips in as the major icon for them. 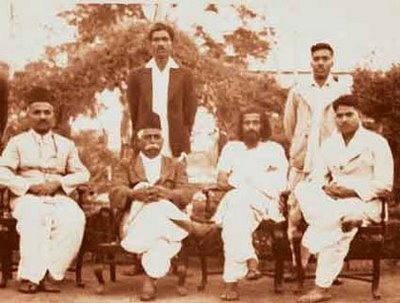 Godse was initially trained in RSS Shakhas and later he went onto become the Secretary of Pune Branch of Hindu Mahasabha. Since many BJP leaders have background in RSS shakhas, and are on same page as Godse as far as Hindu Nationalism is concerned, they do come out to praise Godse. These two, Savarkar and Godse are projected to show their allegiance to the ideology of Hindu nationalism in contrast to Indian nationalism, which is the core part of Indian Constitution. This is necessary for them as they are projecting themselves as biggest nationalists unmindful of the fact that their nationalism is Hindu Nationalism and not Indian Nationalism. They want to derive legitimacy from Savarkars’ initial anti British role. The later part of Savarkar where he kept aloof from freedom movements is the exact way in which RSS also kept aloof from freedom movement. At another level they want to contrast Patel with Nehru. It is meant to undermine Nehru. Patel and Nehru, both were close allies on most of the issues related to freedom movement, both were the major followers of Gandhi, who was their mentor and they were collaborating with each other in the national movement and later as part of the first Cabinet of Independent India. RSS combine cannot swallow the uncompromising stand taken by Nehru during his long years of Prime Minister-ship on the issues of secularism and his long association with these principles in a forthright way so they want to contrast him with Patel, who was also a deeply secular person. At another level there are some in-house icons which are propped up or are undermined. RSS second Sarsanghchalak Golwalkar has been a great influence on generations of RSS workers. His book, ‘We or Nationhood defined’, shaped the thought process of many of them. He went to the extent of upholding Hitler’s method and type of nationalism expounded by him. His book used to be available in RSS shops for long time. One of his quotes sums up the RSS ideology very well, writes Golwalkar “German national pride has now become the topic of the day. To keep up the purity of nation and its culture, Germany shocked the world by her purging the country of semitic races-The Jews. National pride at its highest has been manifested here. Germany has also shown how neigh impossible it is for races and cultures, having differences going to the root, to be assimilated into one united whole, a good lesson for us in Hindustan to learn and profit by. (We or Our nationhood Defined P. 27, Nagpur 1938). From more than a decade ago RSS started feeling embarrassed about this due to electoral-political compulsions and started making arguments that this book was not written by Golwalkar. It was withdrawn from market. Here electoral expediency shaped their decision. At another level they have been projecting Deendayal Upadhayay as the major figure. Deendayal Upadhdyay is the ideologue who had coined “integral humanism’ as the concept, this essentially talks about upholding status quo of social relations of caste in particular. This is done to give a subtle message of deeper agenda of the RSS politics. The play with the icons goes with the long term program of the cultural and social manipulation for building a society with the hegemony of Hindutva politics, a politics which derives its name from a religion but at core is the political agenda of elite of the Hindu society, irrespective of the fact that some from the lower strata of society are also co-opted for this political agenda. It’s due to this that RSS focuses a lot on propagating the culture of a variety which is sectarian and backward looking, the agenda of Hindu Nationalism. WHY IS GOVERNMENT IN A HURRY?